Revit is a type of software known that follows a process known as Building Information Modeling (BIM). This software differs considerably from Computer-Aided Design tools like AutoCAD. In Revit we draw three-dimensional building components and from the assembly of those components we can generate two-dimensional annotated documents. Instead of having multiple files for a project in AutoCAD, Revit contains all of the drawings in a single file. From a project file a great deal of data concerning materials and performance can be extracted. Revit is a parametric software. Changes are made at a global scale. A change made to one portion of the model is updated in all views. Click on the following link for a video overview on the difference between Revit and Autocad: Revit vs. Autocad. Video by Brooke Godfrey. For more information on Building Information Modeling visit; http://help.autodesk.com/view/RVT/2014/ENU/. Once you are on the page go to Revit Users > Introduction to Revit > Building Information Modeling. Read the following sections. What is Meant by Parametric? How does Revit Keep Things Updated? 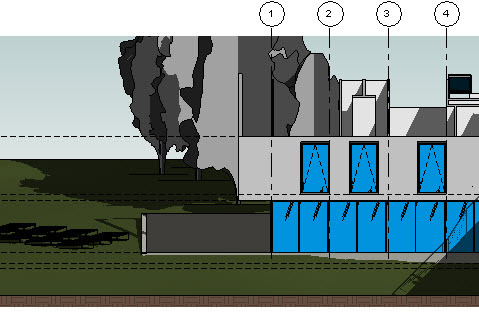 Before beginning to work in Revit, you might find it useful to see how a project is structured using one of the sample projects housed on your computer. By completing the following steps you can acquire a basic understanding the software's structure. i.2. Click on Open. Using the Application Browser save your file to your desktop. You can keep the same name or give another name to the file. We will use the file to understand the basics of the software. i.3. 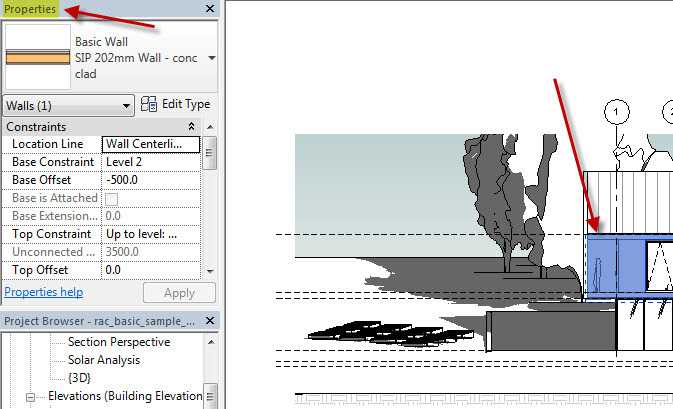 This link on the Autodesk website will provide you to a description of the Revit Interface: http://help.autodesk.com/view/RVT/2014/ENU/. At the link find the Essential Skill video called "Navigate". The video explains how to use your mouse to move around the drawing area. i.4. The Navigation Bar allows you to zoom in and out. You can also right click to use. The Viewcube allows you to move between views, but only when you are in a 3D view. i.5. The Project Browser lists all of the views currently saved in the project. Double-click on the Level 2 tool. The Level 2 plan should appear. Click through the other Levels to see how they will appear. i.6. All components within the file have Properties. Double-click on the South Elevation. Select the wall on the far left of the model. Notice how the object is now blue. Also, notice how the Properties of the wall are not visible in the Properties window. i.7. At the bottom of the Drawing Area is the View Control Bar. i.8. By clicking on the Graphic Display Options icon, you can change the visual style of the view. The elevation is shown in the Hidden Line visual style below. i.9. You can control the visibility of objects by clicking on an object and then clicking on the eyeglasses that are located on the Visual Control Bar. i.10. You can hide a single element or an entire category (all of that type of element), or you can isolate (turn off everything but) a sinle element or entire category. In the image below, an exterior wall has been hidden so we can see inside the building. i.11. Clicking on Reset Temporary Hide/Isolate will return the settings to the default. i.12. Refer again to the following link; http://help.autodesk.com/view/RVT/2014/ENU/. Look for the Essential Skill video called "Families". Within the sample file are a something called Families. If you scroll toward the bottom of the Project Browser, you will find all of the families that are housed within the project file. By clicking on the plus (+) or minus (-) symbol you can collapse or open the lists. In the image below, you can see that Bifold-4 Panels doors are members of the Door family. i.13. 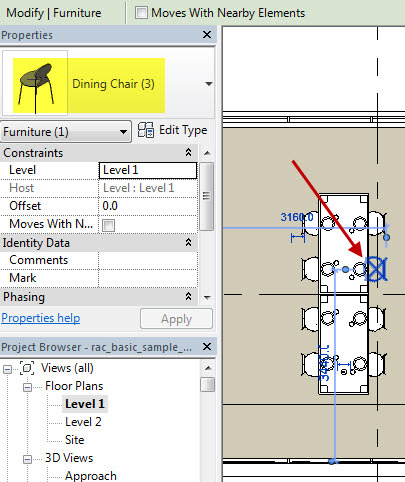 If you go to Level 1 and select a chair surrounding the table, you will see that the chair is a member of the family called Dinging Chair as shown in the Properties window. i.14. The Project Browser and Properties windows appear on the left hand side of your screen. If you accidentally or intentionally close the Project Browser and Properties windows, you can bring them back by clicking on the User Interface button on the View ribbon.